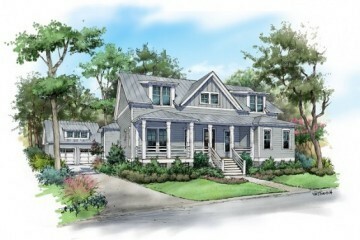 Project brings an architectural fusion of the New England vernacular with Southern coastal style. 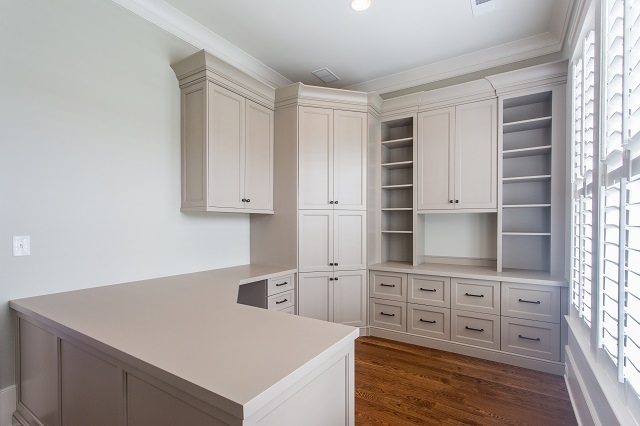 The greatest compliment for a homebuilder is to gain a new project on the strength of a personal referral by previous clients. 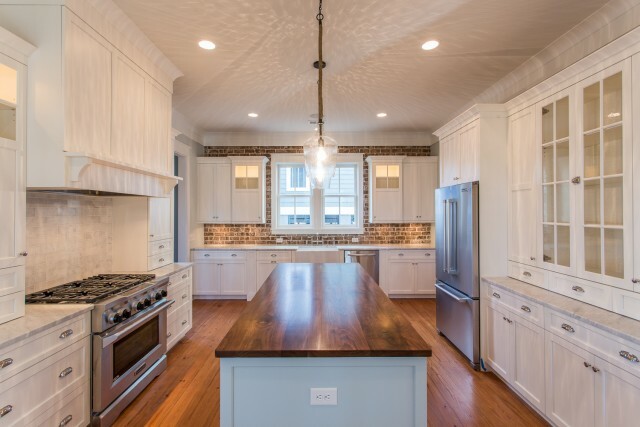 For a local family who selected JacksonBuilt Custom Homes to create their dream home in the Mount Pleasant neighborhood of Hibben, a friend’s recommendation made the choice clear. “Every client referral is priceless to us,” says JacksonBuilt President Richard Jackson. 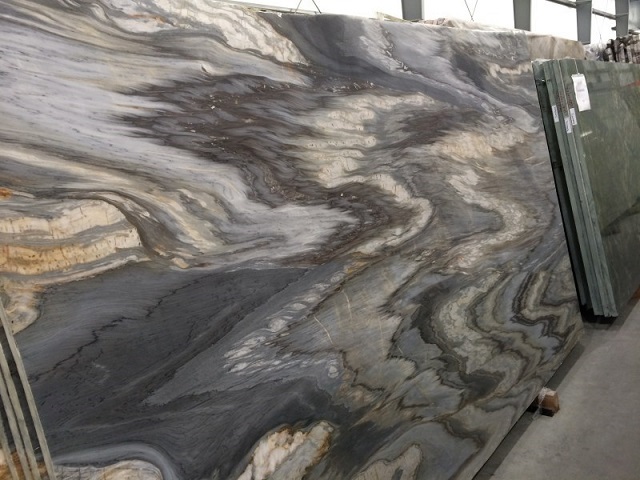 “Each day, we work to make these opportunities happen.” The project is even more meaningful as it is the first build for the company in Hibben. relaxing oasis filled with light. The architectural details of the house speak to the New England coastal influences the homeowners enjoyed so much in their childhoods. 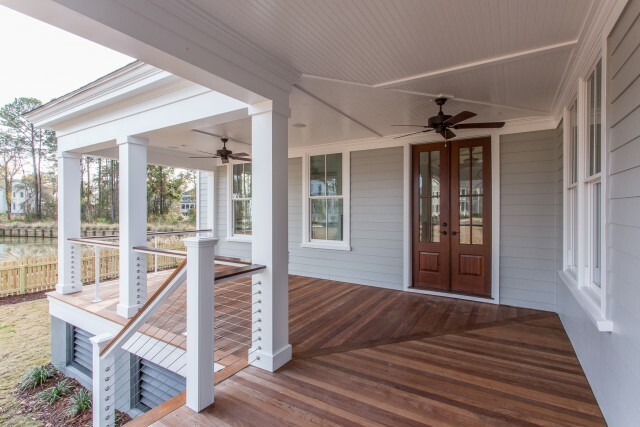 Substantial detailing on the columned porch and articulated window trimwork lend a traditional flavor to the front of the home. A double-length eyebrow roof accents the garage that shares the entry, which is all united by a curved tabby drive. 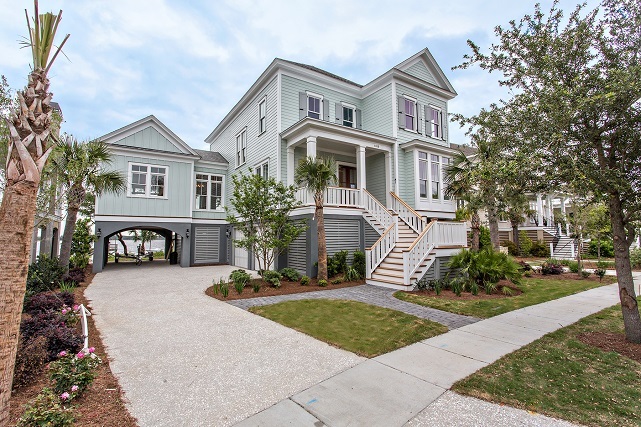 The interior design of the home maintains a coastal feel, but one with a bit more Southern flair. 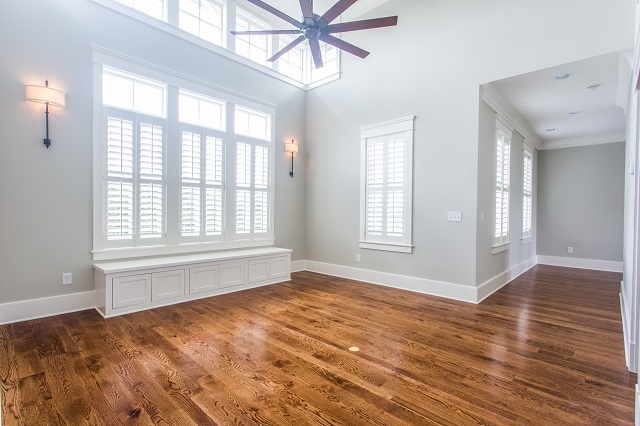 Matte white oak floors are used throughout the project to bring a lightness to the interior. 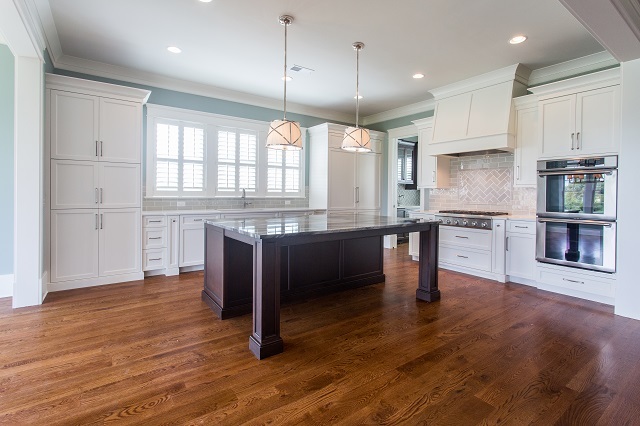 “The floors are, by far, my favorite part of the house,” says the homeowner. 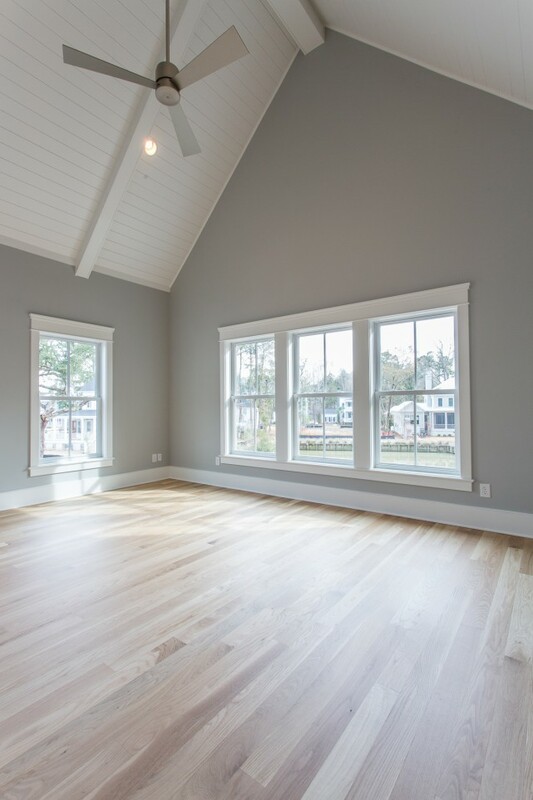 Large, open rooms are painted in a palette of white, greys, and blues to encourage continuity throughout the interior. Board-and-batten trimwork makes a casual statement in the dining room and two-story stairway wall, and a vaulted ceiling in the master bedroom shows how simple, clean lines can still provide drama. 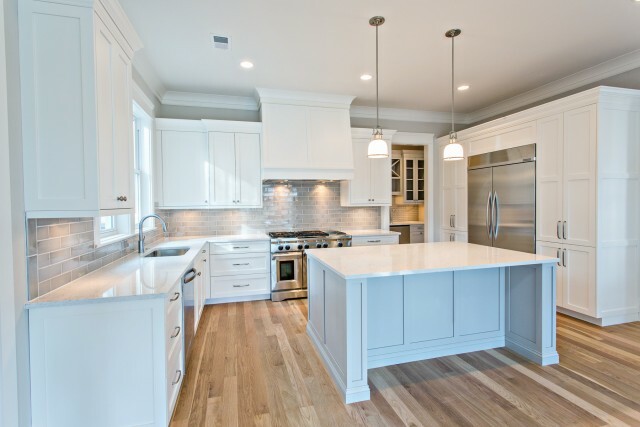 The custom kitchen, outfitted with a 48-inch range and a 48-inch refrigerator, is complemented by a bar area with built-in wine storage, kegerator and a unique tiled backsplash. 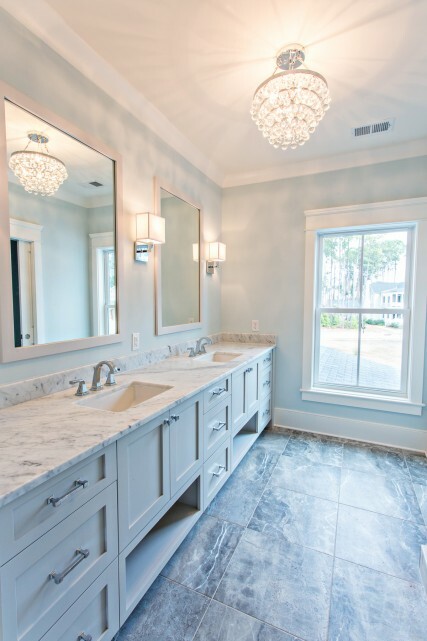 An extra-long master vanity features a honed Carrara marble countertop. Clean-lined cable railings enclose the L-shaped porch; a permanent green space adjoins the lot. 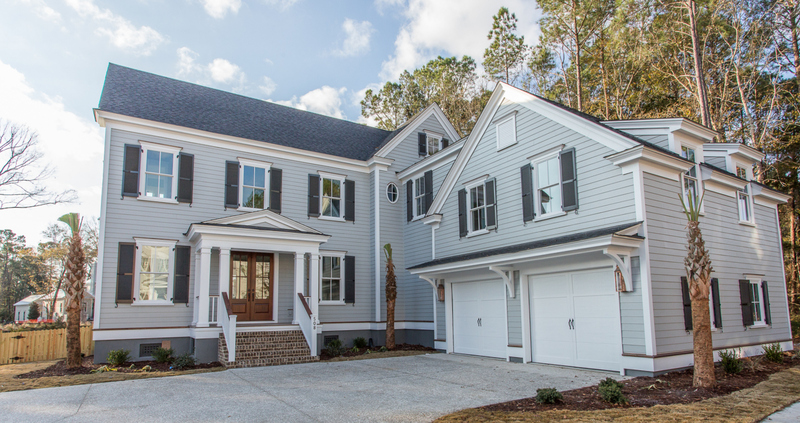 “The lot had amazing potential and was handled brilliantly by residential designer Phil Clarke,” says Allison Casper, JacksonBuilt’s Director of Design, who worked closely with Noell and Susan Smith to create their dream home. 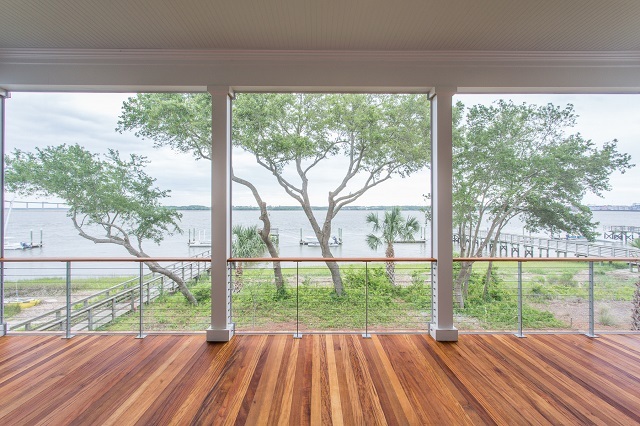 The house is oriented to pay homage to the tremendous live oak tree in the yard where a generous side porch acts as the exterior joinery between the interior dining room, kitchen, and great room. The Smith’s many imaginative design decisions were inspired by the idea of an old farmhouse sheltered by the arms of a grand tree. 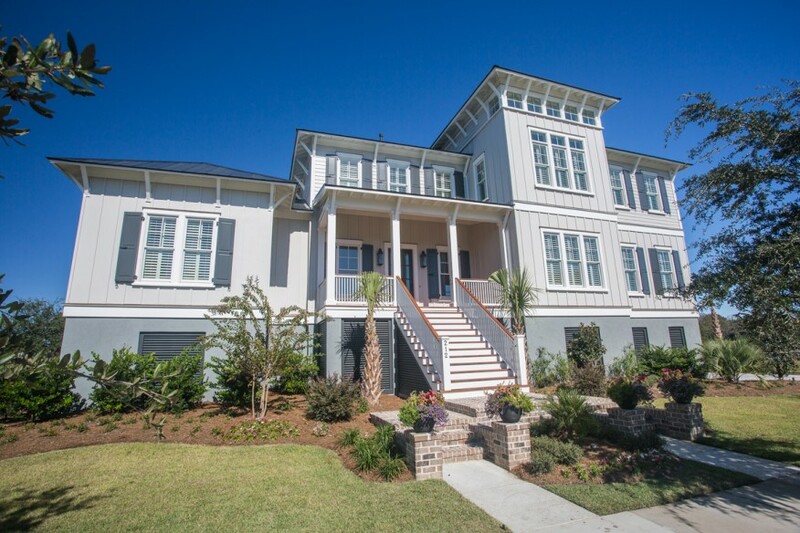 The vision was a blend of the farmhouses Susan knew in her hometown of Georgetown, South Carolina, and of Noell’s love for an old plantation-style home. 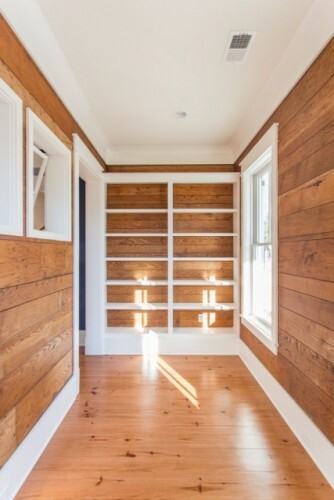 The music room’s salvaged wormy chestnut paneling is faced with simple white bookcases to create room for storage and display. 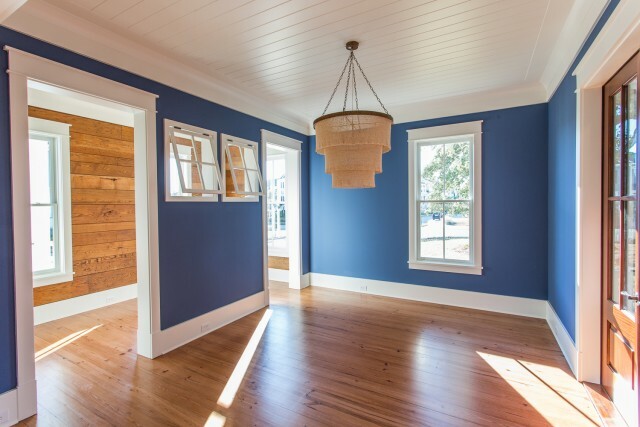 Interior detailing and trim work were seen as an ever-present opportunity to provide the home with the lived-in, accumulated feel of a family homestead. 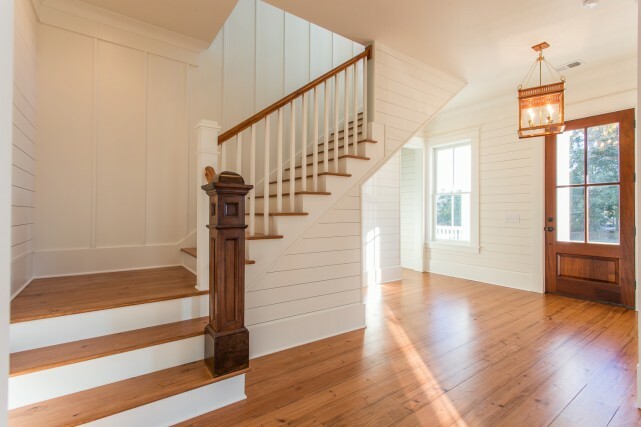 The star of the front entry is an impressive, antique newel post originally from a historic home in North Carolina. Steps away, a dedicated music room is paneled with wormy chestnut boards salvaged from Noell’s family home post Hurricane Hugo. Two antique windows were framed into one wall to create the airy feel of an add-on porch that then looks into the adjoining dining room. Other custom spaces make use of reading nooks, built-in bench seating, and vintage lighting to create areas of interest and surprise. 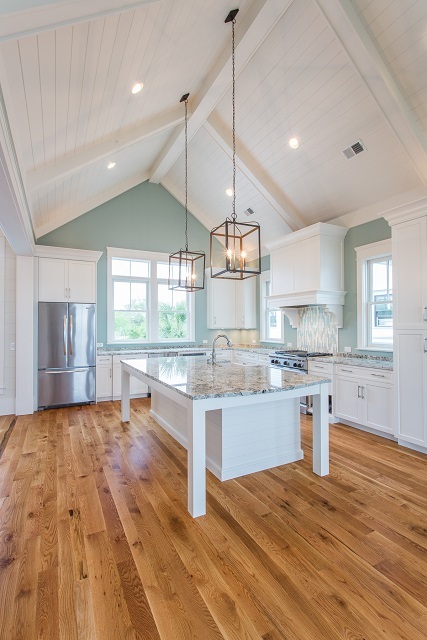 “These special touches are what fires our creativity in building new homes,” says JacksonBuilt’s Richard Jackson, who lead the build and worked side-by-side with the Smiths to integrate their creative details into the home. In all, the project shows how having a team approach can maximize the potential of new-build design choices to yield a home that becomes much greater than the mere sum of its parts. 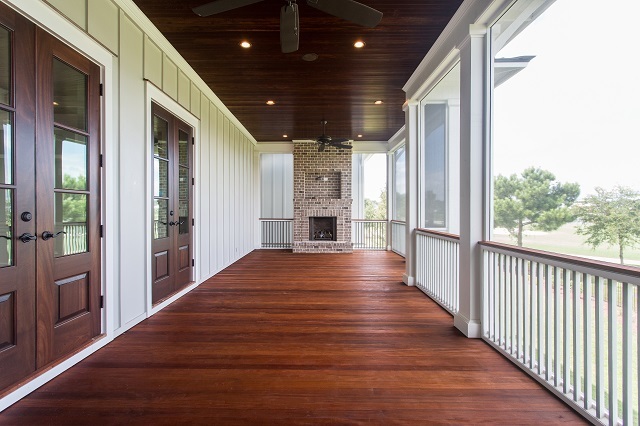 The front entry features cypress board paneling which transitions to board and batten. The newel post is antique. 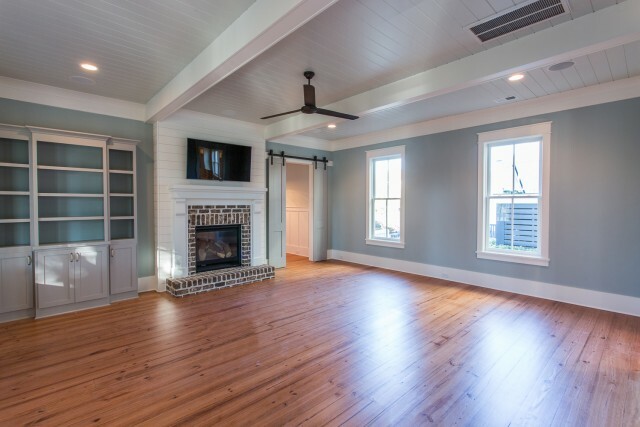 The dining room is open to both the paneled music room and the exterior porch. 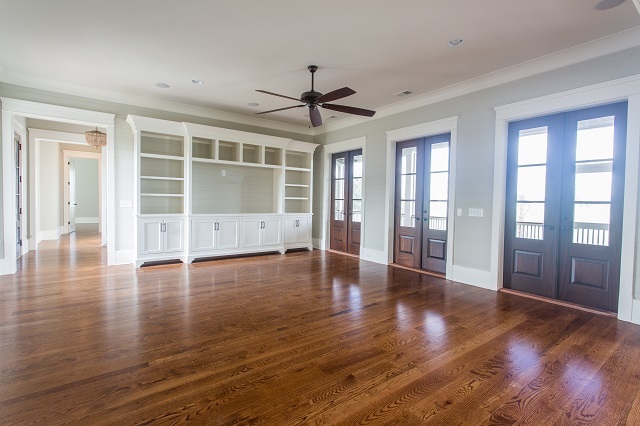 The great room features a large custom built-in bookcase and beautiful sliding barn doors. The kitchen combines a multitude of design choices to create a completely individualized space. 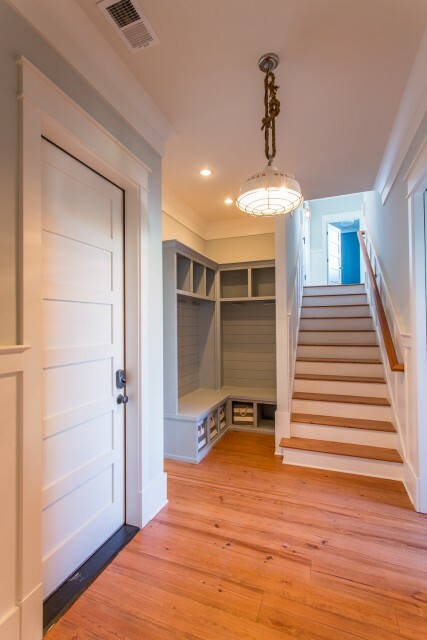 The mud room is outfitted with a vintage light that was refurbished and creatively hung by pulley and rope.